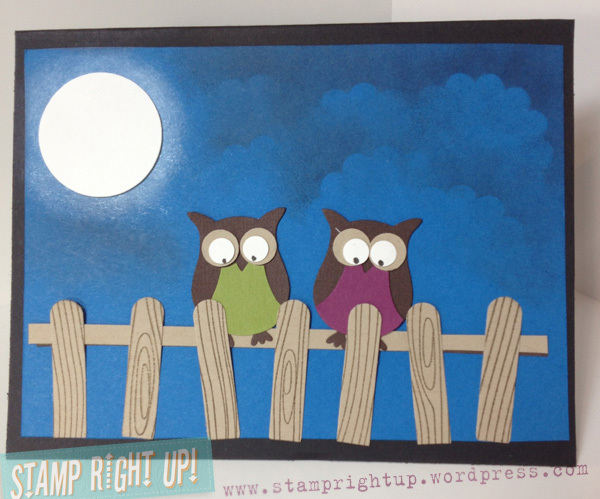 Stampin Up Owl Punch: Night Owl’s | Stamp Right Up! Have I mentioned how much I love this owl punch?! This is my newest tinkering: Night Owl’s. Boyfriend helped me out a bit (he’s a stellar artist so he always helps me polish my ideas). This one was actually super easy once I had the layout done. I found it was the best to punch all the pieces and lay them out first before sticking anything down permanently. Your comments are welcome & very much appreciated! I love owls and I think this card is amazing! Great texture and depth with the fence overlapping the bottom of the owls. I really should get this punch! I’m sure it was fun to do. Great job! Thanks Sherri! It *was* fun to do – and you really should get the owl punch!! It is THE MOST versatile crafting item in my entire craft room!